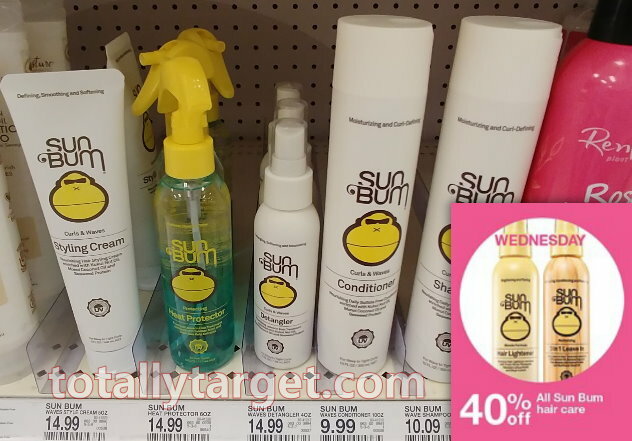 This week thru March 23rd, Target is offering up a different one-day only beauty deal, and today’s deal is a nice big discount of 40% off All Sun Bum Hair Care both in stores and online at Target.com. We have rebates out there to save even more, plus, your purchases will also count towards the spending requirement for our in-ad Target coupon to make for savings of over 70%…. You can mix & match how you wish to meet the spending requirement, so you could mix & match with other items and pay less per Sun Bum + get FREE products. Just for example, you could do this….